Flip Out Mama: Is there anything cooler than Moon Dough? I think not! Is there anything cooler than Moon Dough? I think not! We were really excited to get to try the new Moon Dough formula recently! We have played with Moon Dough in the past, and were always a bit disappointed by the super messy, falling apart dough... This time around however, things were much better! We got to try the Moon Dough Ocean Pals Playset! This was a really fun rainy day activity for our family! With this play set you get three push and pop tools, one mold and two colors of dough. That is plenty for both of my boys and me to play together at the same time! 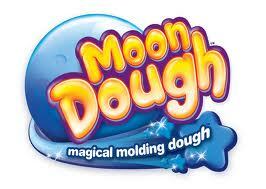 One thing that I really love about Moon Dough is that it is odorless. I hate the smell of that OTHER dough, so this was great for us! Another great thing is that it never dries out. Some people (no names!) around here have a hard time remembering to put things back where they go and they let the OTHER dough dry out.. This was a welcome change! 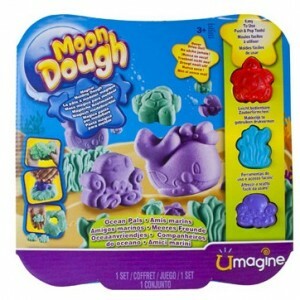 We were really excited and pleased with our experience with Moon Dough Ocean Pals! I love that it was less crumbly than last time. The new formula is definitely an improvement! If you wanna check out the new Moon Dough, click here!